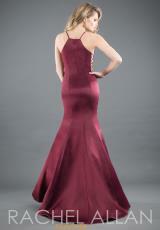 Stunning Rachel Allan couture dress 8280 is the perfect classic dress for any occasion. This dress features a high halter neckline and a sleek fit and flare mermaid silhouette that will flatter your figure flawlessly. This gorgeous dress features lace up sides giving it a dramatic look. Shop at Peaches Boutique for more dresses.